It’s amazing what can be done with found wood, boulders or slabs of stone. Though a 3-seater “couch” carved from a single massive log might be a bit too much for some folks, thinking big (even in a small garden) can be that touch of drama a garden needs. And using reclaimed materials is always a good idea. This massive log 3-seat ‘couch’ got plenty of attention at the display by Bienenstock Natural Playgrounds (part of the 2014 Canada Blooms show) got plenty of attention. This simple log bench was placed in the centre of a large patch of ground cover in woods with a wood chip path leading up to it invitingly. Shot July 2015 during a Toronto Botanical Gardens tour in southwestern Ontario. Stone slabs make a throne-like garden seat in an exhibit featuring garden decor ideas at your front door. Shot at Canada Blooms, March, 2016. These locally sourced stones are clearly for garden seating but look almost as if they sprang out of the earth just as they are on this very spot. Shot at the Coastal Maine Botanical Gardens, June, 2016. You might recognize these three photos from a series of posts I wrote last year about Keppel Croft Gardens in Big Bay, Ontario. These gardens are a labour of love by a couple who bring creativity, humour and a big dose of DIY ingenuity to every feature in their gardens. The trellised archway is furnished with a bench on one side, a crystal chandelier and, on the other side, a vase filled with fresh flowers on a shelf beneath a domed mirror within a gilded sun ray frame. Very posh. The garden bench surrounded by a three panel screen will get shrouded by greenery as the season progresses, thanks to the sweet peas trained up the wire screens. When you enter the Thyme Garden, you approach a small stone wall looking more like garden sculpture than garden seating until you see the other side. These shots were also taken at Keppel Croft. The terraced lawn is bolstered by fieldstones in a style evocative of the many, many farm fences in this area. This is a great example of making a dramatic seating area where no drama originally existed. The stone acts as a semicircular frame around a patch of lawn just large enough for the two chairs and helps to create the terraced garden that overlooks nothing more than a swath of field that has been replaced with turf. Simple. Grand. Perfect. I don’t think these gardens would be quite as interesting or inviting if they didn’t have a place to sit. The seating adds something. Is it purpose? An eye-catching shape? Rustic stone steps winding up to the top of this garden on a steep incline draw attention to the seating at the top of the slope. Shot at Reford Gardens, Quebec, in August, 2014. A small patio with a pergola at one side is flanked by flower beds providing lush privacy for garden seating in a small garden. Shot during the Woodbridge (ON) Horticultural Society garden tour in June, 2016. The rectangular gazebo looks so refreshing compared to the predictable circular or hexagonal shape. On the porch, the usual Adirondacks or woven wicker chairs are replaced with seating that looks both modern and vintage. A nice twist on the traditional gazebo, this rectangular shelter provides shady seating and acts as a segue between two gardens. Shot July 2015 during a Toronto Botanical Gardens tour in southwestern Ontario. One corner of a long porch spanning the width of a grand home shelters two wooden garden chairs with yellow pillows that complement the garden. Shot on a Toronto Botanical Garden tour near Creemore, ON, in June, 2016. 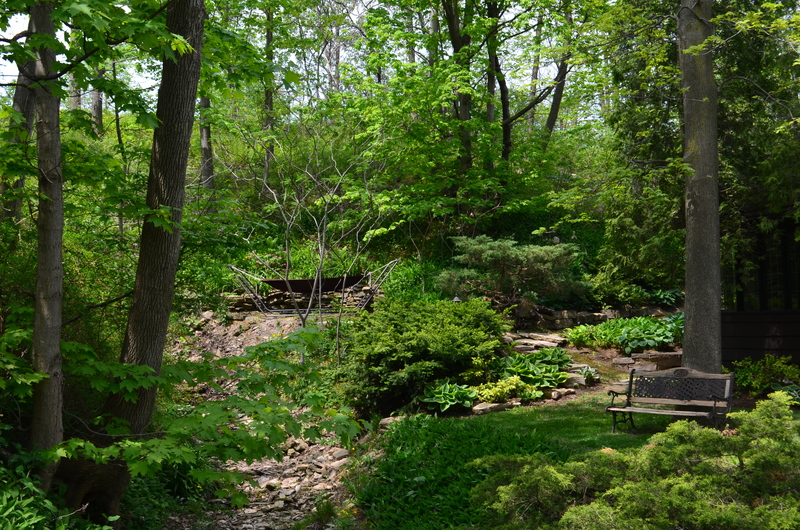 At the back of this large garden is a wooded hillside. A creek bed at one side is so steep that the water (when there is water) cascades into a waterfall. But even in this drought, the garden looks amazing and these two close by but very different seating options offer spots to stop and take in views of the creek bed, now looking more like a ravine or rock garden yet still spectacular. Set on the trimmed lawn and surrounded by carefully tended beds of herbaceous perennials, the formal garden bench looks right at home. Farther up the incline, the muscular design of the metal-framed hammock works well against it’s natural setting. Two moods to choose from, just steps apart. A close-up of the former creek and waterfall. Shot during a Toronto Botanical Garden tour in southwestern Ontario, May, 2016. You can see that the hammock has been sited to take full view of the creek and waterfall. Shot during a Toronto Botanical Garden tour in southwestern Ontario, May, 2016. OK. The shot that looks like a still from a creepy horror movie is actually of an art installation. No one is suggesting you sit on a straight back dining chair, each facing away from the others, to contemplate the scenery around you. But I love the idea of creating a seating area in a naturalized setting simply by adding a raised deck that wraps around a tree and floats over the area. The result would look a bit futuristic and a bit tree-fort-for-adults. Add a few (comfortable) seating options and you’ve got a great place to kick back and chill. The leaf-shaped pool loungers, on the other hand, were around a real pool in a real garden. They just happen to look like what the Jetson’s would have around their pool, if the loungers levitated, of course. This work of art was an entry in the International Garden Festival exhibit at Reford Gardens, Quebec, in August, 2014. Although the chairs look pretty uncomfortable, I love the idea of building a raised deck around a tree in an untouched area of the garden to provide a simple yet dramatic seating area. These luxurious lounge chairs could be mistaken for modern art. Shot during a Toronto Botanical Garden tour in Niagara On The Lake, ON, May, 2016. This urban garden in Toronto is surprisingly peaceful given that a residential street lies just beyond the evergreen hedge. A low-lying water feature encourages visitors to look down rather than up at surrounding buildings and the bubbling water acts as white noise in this bustling neighbourhood. These wooden folding chairs are complementary in size to the small patio and water feature. Shot on a Toronto Botanical Gardens tour of metro Toronto in June, 2015. It’s hard to believe that just beyond the hedge surrounding this garden seating area is a residential street. Despite being only a few meters from parked cars lining the street, this spot looks private and tranquil. Shot on a Toronto Botanical Gardens tour of metro Toronto in June, 2015. These two garden seating areas ignore the fact that there aren’t the usual garden elements like lawn and flower beds. Just add plant containers, a piece of wood used like garden sculpture, or a trellis covered with potted clematis and seats with that “I’m in a garden!” look and, voila, you have a relaxing retreat, no actual garden required. A small area at one side of a garden next to the fence is turned into a stylish seating area. Shot during the Woodbridge (ON) Horticultural Society garden tour in June, 2016. A small side garden between a house and garage provides garden seating with containers of plants in lieu of flower beds. Shot on a Toronto Botanical Gardens tour of metro Toronto in June, 2015. Whether you’ve got lots of space or not much, using a bright colour can give garden seating that wow factor. I was never keen on eye-popping garden furniture until I saw these two gardens. I’m sold. No space? No problem. This garden seating arrangement, at one side of a home, multi-tasks for socializing or dining. A small outdoor bar area with a small, built-in wood oven can just be seen at the far right. Shot during the Oakville Garden tour, June, 2016. Garden seating in bright red can’t be missed in this garden. What’s your garden seating style? Beautiful gardens! And I’ll never look at my brown and crunchy yard the same way again – until better days, it will now be KFC!